These monster cookies look fun but also scary; they are great for your kids or friends who really love chocolate. Also, they are very easy to make and they are delicious, especially with milk. Learn how to do them here. For those of you who love fruits, this is a super fast desert to make. 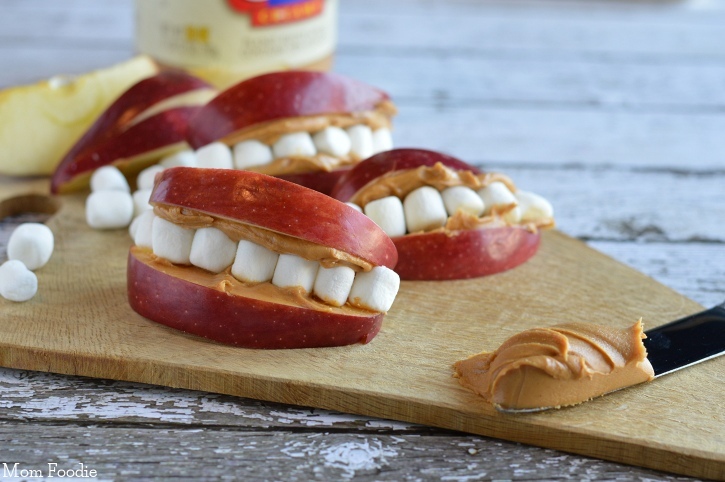 All you need is some yummy peanut butter, some marshmallows and apples and you will get a sweet appetizer, perfect for a fun party. See here how to make it. This desert is the cutest thing ever! It’s perfect if you want to surprise your guests and it’s not that hard to make. Also, the most important thing is that it involves Oreos! So, check out the recipe here. These truffles look really cute and delicious! They are perfect as a desert for the entire fall and especially for your Halloween party. So, check out here the recipe. If you love Frankenstein and the other monsters from ”Hotel Transylvania” these pops are the perfect desert to make. They look really creative so you can learn here how to make them. This is another fun and healthy appetizer you can make for your kids and guests. They look like a character from Monster Inc. and they also are a little bit scary, aren’t they? See the recipe here. There is nothing like mummies in Halloween, especially the meringue and sweet kind. This is a very yummy desert that can be the special element at a party. See the recipe here. ”Buhuhu” you can scream while serving these adorable ghosts appetizers. They are perfect for people who really love strawberries and white chocolate and they are also easy to make. Learn here how to make this desert. If you love M&M’s, this is the desert you need! You can learn the recipe here to make adorable 3D cookies in shape of pumpkins, stuffed with delicious treats. To make these cookies you have to love sweets and have a lot of imagination because you can make them in different Halloween shapes and decorate them in funny and scary ways. Check out how you can make them here.